Researchers have found a way of 3D printing microstructures that change shape under the influence of light or temperature. We can already use laser-based 3D printing to produce anything on a micrometer scale. However, in biomedicine and some other applications, printing switchable rather than rigid structures would be more desirable. This is what a team of scientists has managed to do. The researchers, from Heidelberg University and the Karlsruhe Institute of Technology (KIT) wrote about their work in the journal Nature Communications (citation below). The authors were Marc Hippler, Eva Blasco, Jingyuan Qu, Motomu Tanaka, Christopher Barner-Kowollik, Martin Wegener, and Martin Bastmeyer. 3D printing has become an established technology in several fields. Experts say that direct laser writing is a particularly promising method. A focused beam, which a computer controls, acts as a pen. It creates the target structure in the printer ink, which here is a photoresist. In this way, we can create any 3D form down to a size of a few micrometers. 1 micrometer = 0.001 millimeter. A photoresist is a light-sensitive material we can use in several processes, such as photoengraving and photolithography, to form a patterned coating on a surface. In the electronics industry today, the process is crucial. Prof. Bastmeyer and colleagues have developed a printing process for such movable structures. They use stimulus-responsive polymers for the printer ink. External signals modify the polymers’ properties. With just a slight rise above room temperature, the chemical compound poly(N-isopropylacrylamide) changes shape significantly. The 3D microstructures created using the compound were functional in aqueous (watery) environments, and therefore ideal for applications in biology. They are also ideal for applications in biomedicine. Grayscale lithography makes this possible. The photoresist is not exposed to the same intensity at every point, but rather in a graded manner. This allows the strength of movement at a specific temperature change to be set very precisely. Computer simulations can predict the resulting movements accurately so that researchers can design 3D structures rationally. The researchers have gone one step further. They have used light as a control signal, rather than temperature. This allows, for the first time, the targeted control of individual microstructures in complex, 3-dimensional arrangements. We could use this feature in, for example, microfluidic systems. 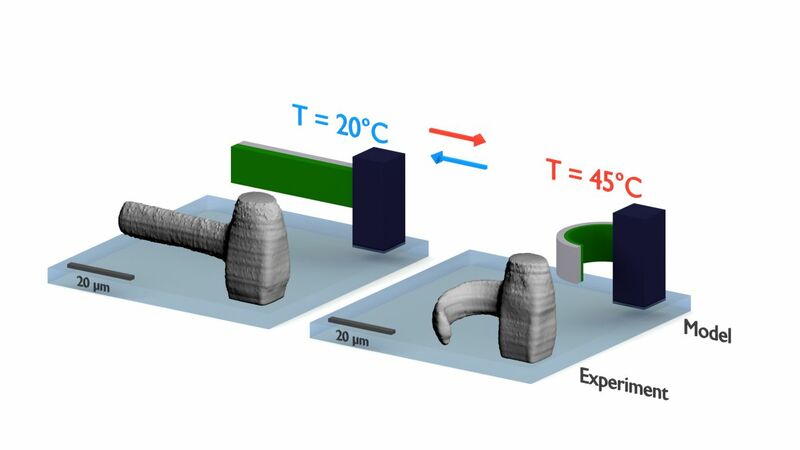 “Controlling the shape of 3D microstructures by temperature and light,” Marc Hippler, Eva Blasco, Jingyuan Qu, Motomu Tanaka, Christopher Barner-Kowollik, Martin Wegener, and Martin Bastmeyer. Nature Communications, Volume 10, Article number: 232 (2019). DOI: https://doi.org/10.1038/s41467-018-08175-w.